Sound Therapeutics is at 282 St. George St. in Duxbury, Ma. The perfect choice when you are ready to let go and grow beyond the stress. Deb Barrett provides profound relaxation and deep connection with Inner Self through the use of the always gorgeous and divine DreamWeaver vibro-acoustic sound womb. The DreamWeaver provides a safe space for growth and change through the use of a sound mat that allows you to FEEL the music pulsing through your body and the sacred geometric form, the dodecahedron, which holds the frequency of sacred space, allowing for all possibilities. When you arrive you can expect to be embraced and greeted with a smile. We will sit and chat about where you are and where you would like to be. Then we will create a working intention for your well being followed by your time on the sound table. You will be fully dressed and comfy. Harmonic frequencies in the form of music will surround and penetrate your body, mind and Spirit. I will do energy work including Reiki, Healing Touch, tuning forks and essential oils. Expect to feel dreamy and aware, restored and rejuvenated. We are currently open on Saturdays and Tuesdays. All session are by appointment. If you would like to book your session or get more info. please contact me at debbarrett808@gmail.com. 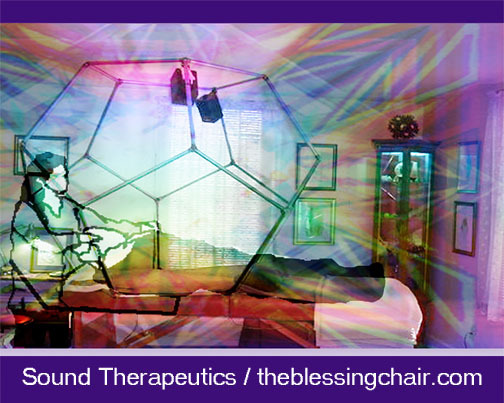 I will be delighted to discuss how a Sound Therapeutics session would benefit you personally. When we take care of ourselves we get to experience the best life has to offer. Sessions are generally 90 minutes. I look forward to working with you in sacred space and liberating you from the effects of stress.